Just when I’m struggling for what to write about, it occurred to me: we moved! Natural Comfort Kitchen has a brand new (to me) kitchen, it’s a dream come true, and I want to tell you all about it, but not before we talk about stuffed squash. 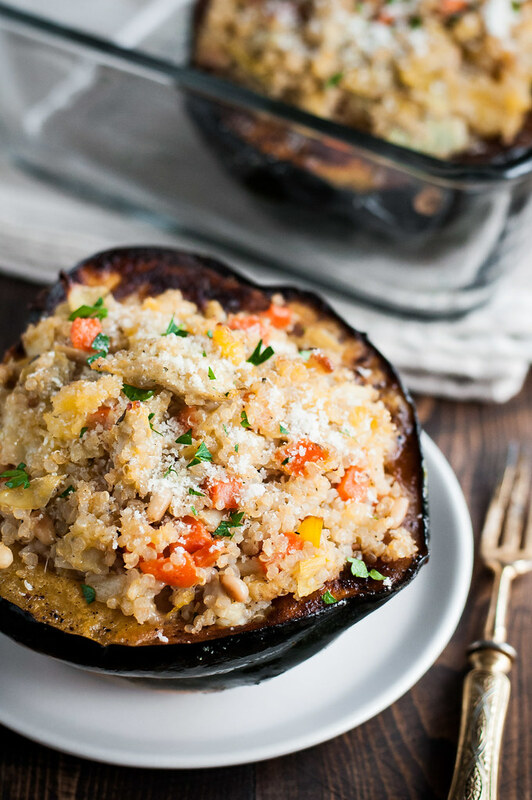 Last time, I wasn’t fully on the meatless wagon yet, so I wanted to share a twist on the original quinoa stuffed acorn squash that’s just as satisfying, without the pancetta. Specifically, artichokes add a chewy, meaty texture and that unique delicate sweet taste, and a little handful of cheese (two types, if you’re feeling frisky) is plenty salty to overcome the lack of pancetta. I’ve also mastered browning the squash rim, so I dirty one less pan than last time. What’s great about stuffed veggies is…actually, there are many great things. One, they’re freakin’ adorable. Two, they’re a one dish meal and, as a result, my jam. Three, prep is streamlined, because you roast the receptacle (I know, strange word choice) veggie while you get the filling ready, so what would otherwise be an excruciatingly long recipe becomes uber efficient. Finally, they are the most flexible meal to prepare, all while looking like you spent hours planning and crafting such an elaborate dish. I prefer a moderate ingredient list for my filling, but you could literally mix some quinoa, artichokes, cheese, and a squeeze of lemon juice, throw it in the squash hole, and call it a day. I’m talking about our move, and I have just a few pictures to show you, too. Like this one. Taken before we really moved in…I only wish my kitchen was always this minimalist. 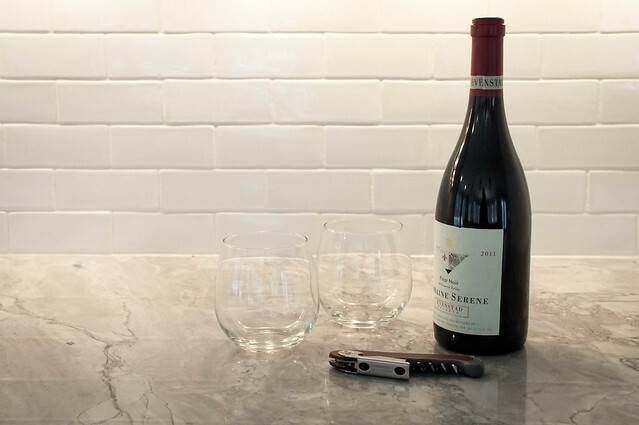 After two years of learning food photography in a yellow kitchen (wood floors and cabinets) with black countertops and far less than ideal light, Steve and I knew that as we shopped for our first purchased home, the kitchen would be a prime consideration. 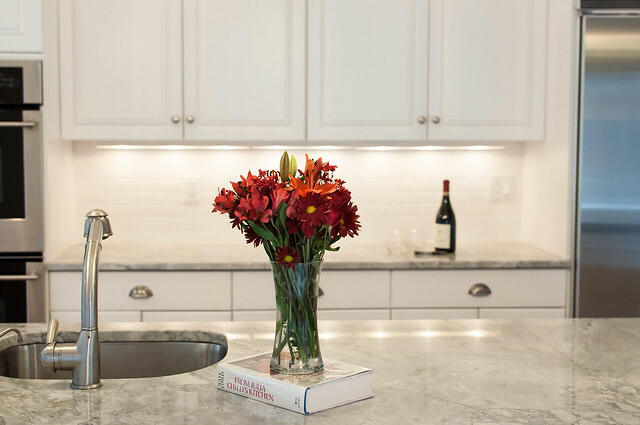 The thought of renovations causes me to instantaneously burst into tears, so despite a difficult (i.e., expensive) market, we really wanted to find a home with a move-in ready kitchen. Like, the rest of the house could basically be in shambles, but if I could come in and start shooting pronto, I’d be a happy camper. Long story short, all our dreams came true. What is typically a bad buying season for everyone else, just after the school year starts and so close to the holidays, was the ticket to a 1973 home that is in immaculate shape, including many upgrades over its life and a kitchen remodel in the mid-2000’s. After one day of shopping around, it was clear no other options in our budget would basically allow us to come in an unpack our stuff, which is what I’ve been up to for the last week (that, and cooking Thanksgiving dinner). And the kitchen. 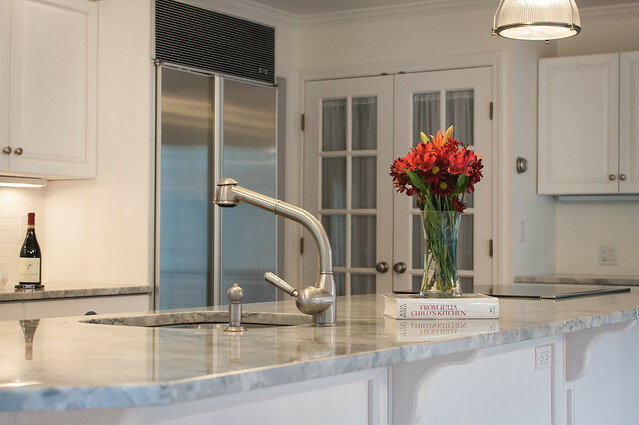 Picture the setup of every cooking show ever: long island with sink and stovetop, then appliances, counterspace, and usually a citrus bowl behind it. That’s my kitchen! 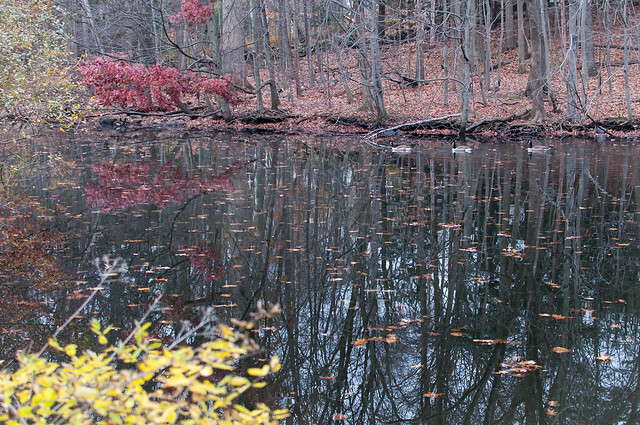 The island faces a large nook with space for informal dining, and a view of OUR POND! Yes, our pond, filled with mischievous looking geese who are becoming quite cavalier about coming ashore in our yard. Not only is the kitchen perfect for cooking (two ovens with convection, Sub Zero fridge), it’s a food photography dream. 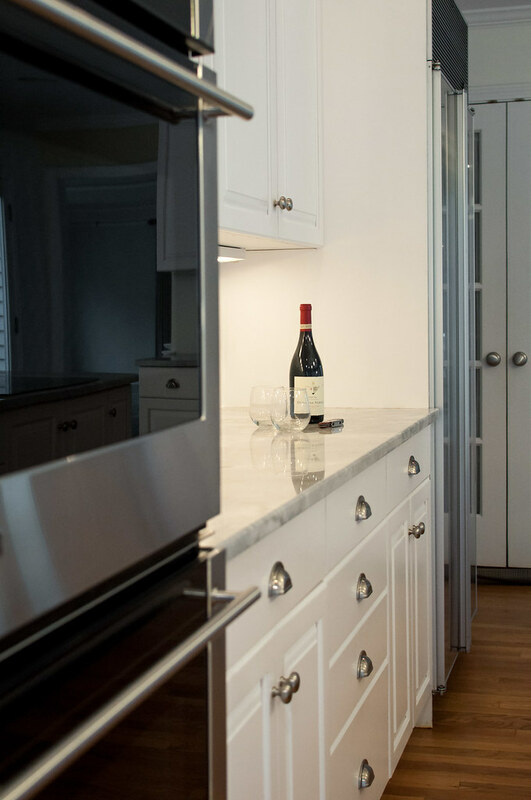 Gray/white countertops that are not super shiny, white cabinets, and exterior walls that are practically made of windows. Great for food photography, not so good for heating bills. The photography wins. Our only big upgrade will be to replace the induction stove with gas in fairly short order. Although, I’ve been pleasantly surprised with the high end induction cooktop. It reacts quickly to temperature adjustments–my tea kettle boils in less than half the time it used to take!–and it’s a mirror? Yes it is, but I’m not sure how I feel about that, other than it being easy to clean. It’s also much safer, since it won’t heat up if it doesn’t sense a pan on the surface. If you have kids or are clumsy, I’d highly recommend it over electric. Conversely, if you’ve recently purchased a professional-type gas range, please let me know what you have and how you like it! I sense a very tough decision coming on, and with the price tag involved, I want to make sure I do the right thing. So that’s it! I’m still buried in boxes, but it’s all good. Every time I pull into the driveway, I can barely believe that this is our home to start married life in together! More squash recipes and a few more house pictures to come as we get settled and get a couch that doesn’t look awkward in the living room. 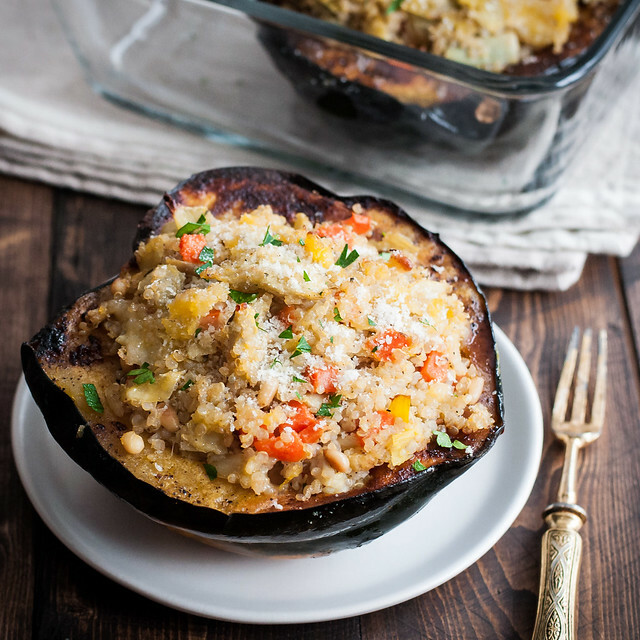 Based on my rustic quinoa stuffed squash recipe, with a few tweaks and twists to lighten it up and make it meatless. Preheat oven to 450. Brush cavity and cut surface of squash generously with butter or oil, then sprinkle liberally with salt and pepper. Place cut side down on a rimmed baking sheet, add 1 tablespoon water to the tray, and bake about 30 minutes until easily pierced with a paring knife and skin is slightly wrinkled. Flip cut side up to cool. Bring a scant 1 cup vegetable stock (or water) to a boil in a small saucepan. Add quinoa and bay leaf, cover, and reduce heat to medium low. Simmer 15 to 20 minutes until done. Remove bay leaf and strain in a fine mesh strainer to remove excess liquid. Place in a medium mixing bowl, season with salt and pepper, and set aside to cool. In a dry skillet, toast pine nuts over medium until golden, stirring often, then cool on a paper towel. In the same pan, heat 1 tablespoon of oil. Add carrot and leek and cook until softened, then add garlic and cook another minute. Stir in artichokes, thyme, oregano, 1 tablespoon water, and apple cider vinegar. Simmer about 10 minutes, until liquid is nearly evaporated. Add artichoke mixture, pine nuts, soft cheese, and parmesan to bowl with quinoa. Season to taste with more salt and pepper. Transfer roasted squash to a baking dish with higher sides to keep them from tipping over. Use a spoon to scrape ⅛ to ¼ inch of flesh from the squash cavity, creating a larger “cup”. Chop extra squash and add to the filling. Scoop a cup or more of filling into each roasted squash cavity, packing it firmly and mounding it on top. Bake at 375 for 10 to 15 minutes, until filling is settled and cheese is melted. If making ahead, refrigerate before baking and extend cook time until squash and filling are heated through, about 20 to 25 minutes total. To keep it strictly vegetarian, omit parmesan and confirm that the soft cheese, if using, is free of animal rennet. Depending on the size squash you use, there may be leftover filling. It's great warmed up as leftovers, alone or as a side dish. Note: This page contains affiliate links. It does NOT contain sponsored content. Affiliate links (to products I recommend, on Amazon) offset my ingredient and website maintenance costs, so I can keep bringing you healthy recipes like this one. Thanks! Your kitchen is beautiful and that view, enticing. I would be a happy girl with the view – inside and out. Congrats on your first home. I still and probably always will be a lover of meat, but I really like vegetables too. I will never be the healthiest as I just don’t care for any dried peas or legumes. Wondering what else can stand in for them. I do like most other vegetables. Thanks Mary! As far as substitutions, did you mean generally or for the quinoa in this recipe? It feels more like a grain, so I would sub rice or cous cous (the latter isn’t gluten free) here. Legumes and peas are a good mix of fiber and protein, so finding a similar substitution can be tricky. On the off chance you like tofu, that’s always good, or corn kernels, frozen or fresh. Chopped cauliflower sometimes works, and I love mushrooms and eggplants as bulky meat substitutes. It really depends on the recipe. I also love a bean purée, which can be strikingly similar to the consistency of mashed potatoes. If you prefer, a lot of my recipes are conducive to including meat. If you have questions on other specific recipes I’d be happy to offer suggestions! Bethany that’s what I love about it! It’s always my argument when serving meatless dishes to heavy meat eaters :) Thanks!